Situated in Braintree, Essex, Braintree Village is a shoppers paradise. Filled with brands you want at prices you’ll love. Over 85 stores showcase some of the most desirable fashion and lifestyle brands, offering savings of up to 60% off all year round. Conveniently served by its own train station, the centre is easily accessible by public transport and less than one hour away from central London via rail. 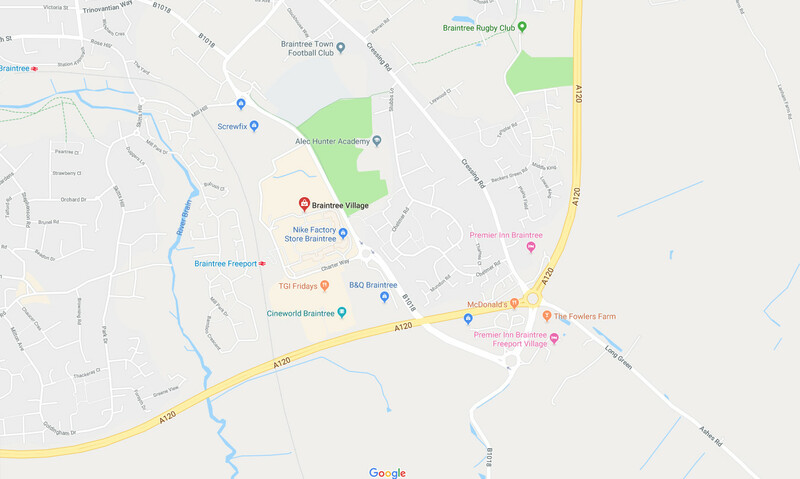 With a FREE shuttle bus service from Braintree town centre and close proximity to the M11 and Stansted Airport, Braintree Village can be easily reached by all. From the M11, take Junction 8/8a and follow the signs for the A120 east. From the A12 London, take Junction 19 and follow the A130 then take the A131. Follow the brown tourist signs. From the A12 Colchester, take Junction 25 towards the A120 Stansted Airport and follow the brown tourist signs. Ample FREE car parking is available for all Braintree Village shoppers with 1,500 car spaces and 10 coach bays. Parking Charges - 6 hours FREE parking. Braintree Village shoppers who use the car park for more than 6 hours will need to extend their free parking by visiting the Tourist Information Centre to validate their car registration and avoid a penalty charge. Alternatively, you can pay to park for the day with the rates as listed below. Payment for LONG STAY parking can be made by phone or online. Non-shoppers can register by phone by calling 0203 046 0010, quote the location code 5199 and use your credit or debit card to pay. By train, from London, Liverpool Street to Braintree (Freeport) Station, regularly throughout the week. Unfortunately there is no step free access between the train and the platform. Unassisted wheelchair users should contact Greater Anglia on 0845 600 7245 (option 4) in advance of travelling who will then make arrangements to provide a guard and a ramp for their chosen train service. There is a free service running from Braintree Town Centre bus station to Braintree Village every 20 minutes from 9am. For further information on transport, accommodation and local attractions please contact the Tourist Information Centre on 01376 348 168. Stansted Airport is just 17 miles away from Braintree Village and can be easily accessed by car or bus service. The SX Connect 133 is not just for those going to Stansted Airport as it also provides the quickest route between Colchester, Marks Tey, Braintree and Great Dunmow. Connect with the free shuttle bus at Braintree to go shopping at Braintree Village. With reasonable fares, stylish comfortable modern vehicles and the most direct route, why would you not catch the SX Connect 133?